I give SKAR permission to collect and use my data submitted in this form. Youth Member (Age 13 and under): Youth members will require a parent/guardian or parent/guardian designated individual with them at all club events. Cost is free. If you would like to join, please print and complete our membership application. 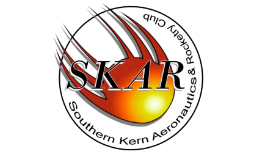 When complete, you may email it to membership@skarclub.org or bring it to your first club event. Membership fee can be paid via the paypal link to the left or by cash or check at the next club event. Please make checks payable to SKAR. Launch is a go this weekend!